To prove the theoretical performance of the EiP wind machine, we built a prototype, about one third smaller than a production machine (so it could fit through the garage door). At this point, an experimental lab fixture had validated EiP wind machine electrical design. Real-world testing of EiP wind machine aerodynamics in destructive wind conditions was next on the agenda. Fortunately, storms with wind gusts greater than 55 MPH are a fairly common occurrence here on the central Oregon coast. The prototype is of minimal dimensions (EiP technology is naturally scalable to larger size and power). Since the wind catching area is undersized, high speed winds are necessary to get enough lift across rotor blades. A special platform was required that allows safe and quick deployment from the lab garage into extreme weather outside. So, weighing around 900 lbs., the prototype was mounted on a heavy duty golf cart (Club Car Carryall), equipped with a charge controller and inverter attached to its 48 volt battery bank. On this apparatus, the EiP wind machine under test was free to wobble and sway in wind gusts, supported only by shock absorbers and rubber tires, and easily moved into the driveway. Then, aerodynamic performance could be observed in real-world storm conditions. One key observation showed that in high speed winds the rotor seems to “fly” within the structure that contains it. This is explained by windflow at high velocity that cushions and lubricates the gaps between rotating and stationary parts, while rotor torque lifts weight off the bearings. Magnetic attraction between rotor magnets and stationary inductor cores guide horizontal rotor position, while airflow maintains a perfect magnetic gap above and below. The sound of the rotor is quieter as wind speed increases with zero vibration. Amazing! In this state, the rotor reaches the point where it can spin no faster regardless of wind speed, referred to in EiP theory as “cruising speed”. A minimal number of bearings in the prototype provided only enough support and guidance for the bottom of the rotor until it attained cruising speed (which depends on rotor diameter; a larger rotor has a lower cruising speed). While cruising, the rotor is self-balancing within its magnetic and airflow containment, instantly maintaining speed and balance along with uniform magnetic gaps in strong gusts. With no central shaft, the rotating mass follows the “right hand rule”, where angular momentum in the direction of the fingers (multiplied by the radius), and a torque vector in the direction of the thumb increase with speed. In EiP technology, the torque vector becomes a virtual shaft around which rotor mass instantly balances when suddenly knocked off-balance by powerful wind gusts. This virtual shaft combined with strong magnetic forces between rotor magnets and stationary iron core inductors, stabilizes and cushions the rotor for smooth and quiet operation. At cruising speed, the air flowing through the machine provides additional support and lubrication, resulting in quieter and smoother operation the faster the wind blows. This demonstrates a key feature of the EiP wind machine: continued stable operation in conditions where conventional wind turbines must be shut down or face certain destruction. By 2PM testing was completed and the golf cart was moved back into the garage. A quick analysis of the data validated internal aerodynamics, where wind from the forward direction enters the upper left quadrant and exits the lower right, creating a laminar and steady windflow perfectly suited for the rotor. Rotor wing blades fly in the incoming and outgoing streams. As each blade passes through, its attack angle rotates, providing a hybrid lift and drag effect that produces strong torque evenly around the rotor, from winds of changing direction and magnitude. No wobbling or vibration is observed at high wind speed. As predicted by EiP wind machine aerodynamic theory, internal windflow is undisturbed by wake vortices from windblades, which in the forward quadrant peel off wing ends and escape through the hollow top and bottom on inflow. Outflow wake vortices exit top and bottom on the outside of the rear quadrant. Laminar flow in the middle of the machine is undisturbed, as the central wake vortex appearing at the top and bottom exterior instantly removes all disturbances to the internal windstream. The experiment also demonstrated how gusty and turbulent conditions outside are converted to stable laminar conditions inside for the rotor. This eliminates the need for a tower. The natural stabilizing and quieting of the rotor in destructive winds has been observed and validated. This is key to the ability of the EiP wind machine to operate without adjustment, generating power beyond the point that would break apart conventional windblades. Steady and vibration free, in an architectural and sturdy package, power production continues normally during the most powerful moments of a windstorm. The golf cart experiment was a great success! The next step in validating theoretical performance was to place the EiP wind machine prototype onto a fixed test pylon outside our lab in Yachats, and perform a detailed analysis of electrical performance vs. wind speed. On February 9, 2015, the strongest storm of the season lashed the Oregon coast with gusts from 70 to 90 MPH. 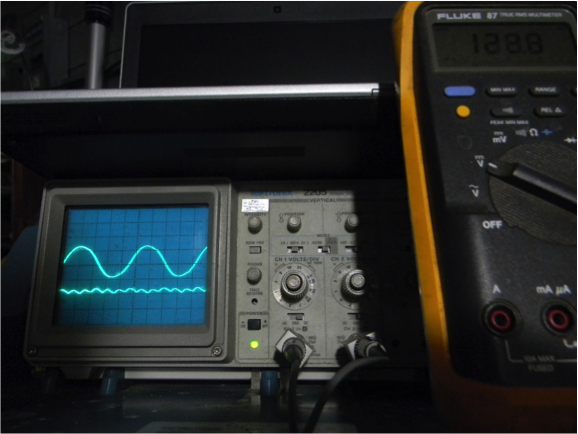 Using an oscilloscope and voltmeter, and a digital camera with timestamp, data collected and compared with NOAA weather data revealed the power curve for the EiP wind machine, which is linear. The open circuit voltage, plotted with respect to rotor magnetic frequency, showed synchronous output of 1 volt per Hz, over a range of wind speed from 10MPH up to cruising speed, where at approximately 60MPH the output voltage was around 300 volts. The prototype handled the strong gusts effortlessly, with electrical output unaffected by wind and rain. During maximum wind conditions, hanging onto the test pylon from below I was able to take handheld measurements of internal windflows, which further validated theoretical performance in extreme winds. 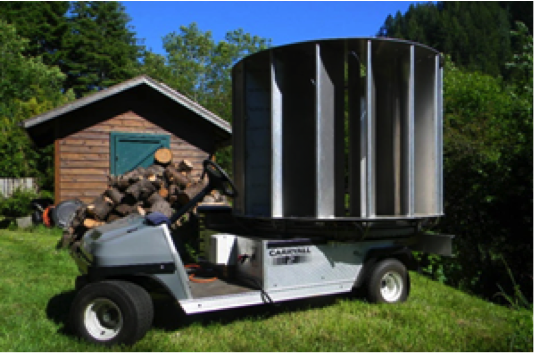 There was widespread damage to trees and structures during this storm, while the EiP wind machine prototype came through unscathed. One aspect of performance in turbulent gusts was revealed in observations of the prototype as it speeds up from standstill to cruising speed. Rapid response to wind speed and direction changes is observed as the rotor quietly and rapidly accelerates to full speed. Ongoing testing continues as we wait for more storms to come.